Perfect Food ® is a powerful formula packed with antioxidant green grasses, micro algae, sea vegetables, whole vegetables and their juices, sprouted grains, seeds, legumes and acerola cherries. 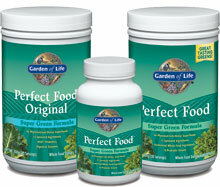 One serving of Perfect Food® powder is equivalent to 140 grams of fresh grass juice. then click " Add to Shopping Cart"
will all be combined for price breaks.